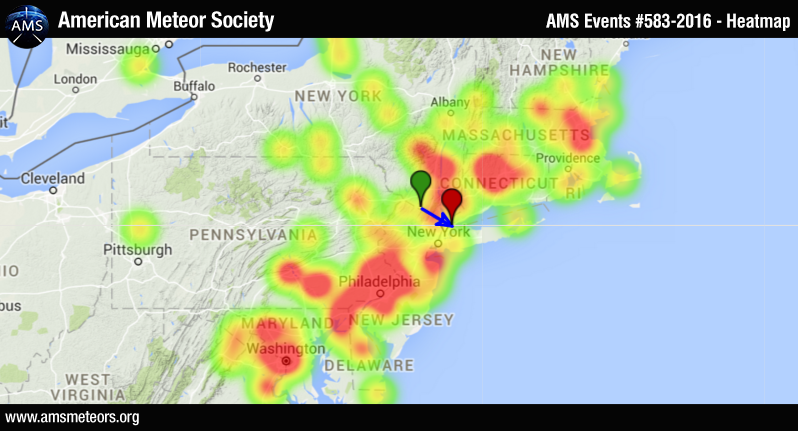 The American Meteor Society has received nearly 110 reports of a bright fireball on Sunday, February 14th, 2016. It was observed over a large portion of the Northeastern US. The fireball was seen primarily from Pennsylvania, Connecticut and New York but witnesses from Delaware, Massachusetts, Virginia, New Jersey, New Hampshire, Vermont, Rhode Island, West Virginia and Ontario (Canada) also reported seeing this fireball. This event occurred near 04:30am ET (09:30 Universal Time). Below is a video from ©Bill Conklin who caught the fireball over Dover, DE. Below is the heat map of the location of the witnesses and the estimated ground trajectory of this event. The AMS online member Swasing Kate caught the reflection of the fireball on a parking lot. For more information about fireballs, read our FAQ. I was lying in bed after being up from using the bathroom. It was about 4:35am on Valentine’s Day. I was trying to doze off when my bedroom was lit up by the whitest, brightest light I have ever witnessed. It was a brilliant larger flash followed by a shorter bright flash. I thought it was lightening but it was MUCH brighter and definitely more white. It was as if someone were outside my house with one of those roadside construction work lights flashing it on and off. I waited (and waited) for the thunder, but nothing. It was definitely a minute (maybe longer) when I heard, and FELT, the muffled “boom”. My wife was awake at this point and said “What was that?”. I believed at the time that SOMETHING hit the earth. I though I was crazy until my friend found this online. Saw a similar one (was brighter and a little longer) this evening, Feb 16th, 2016 at approx 7:13PM in Newport, Delaware. Was a brilliant green and at first I thought it was a low flying airplane buzzing the New Castle County Airport! Chuck – you think that was a meteor? saw it in northern VA at travelling east to west about 7:12pm on 2/16/16… thanks for the reply. I saw this Fireball. Drexel Hill, Pa. I witnessed a meteorite on February 16th at approx 7:15 pm while driving. I was travelling south on Delaware Route 1 between the Town of Frederica and Milford in Kent County. The meteorite flashed in the night sky at my 10 O’clock then streaked a bright white tail from east to west (perpendicular) across the center of Route 1, travelling toward my 2 O’clock, then flashed white and split into streaking parts before burning out and glowing red. Was travelling faster than an aircraft. Seemed close but it is very hard to judge distance at night and looking against a dark sky. But I definitely saw it break and could see the parts glow red after it broke because it stopped streaking bright white. It seemed on a downward path toward the ground but disappeared into the darkness. Could have landed miles away or tens of miles. Hard to judge the distance at night.